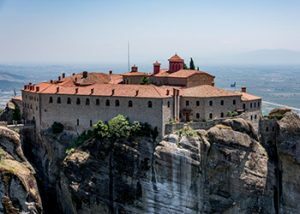 The area of Meteora is located at the northwestern edge of the plain of Thessaly, in central Greece, near Pinios river and Pindos mountain. It is a landscape of a unique beauty and a place of an important monastic tradition. Meteora is a complex of rocks, it is a geological phenomenon, impressive and unique but it is also a very important center of monasticism, of the Orthodox christian church. 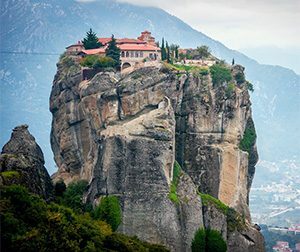 During the 14th century the first monasteries were organized on the rocks of Meteora and in the 16th century they were 24 communities. 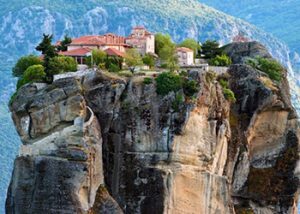 Today the monastic area of Meteora is an active religious center. There are six monasteries, all active and all open to public. Since 1989 METEORA is on the list of UNESCO about the monuments of the world heritage. 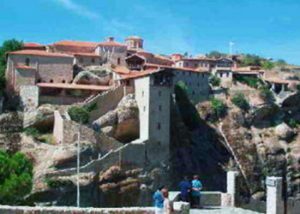 A visit to the monasteries can start from the town of Kalambaka or even the small village of Kastraki. On the top of the highest rock one of the monasteries is located. 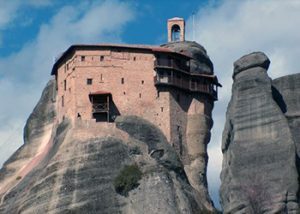 It is the Great Meteoro, the biggest and the first one that was established there in the 14th century by Holy Athanasio, who is considered to be the founder of monasticism in Meteora. The monastery, renovated and open for the visitors, is offering an unforgettable experience to all who will spend time so as to visit every part of it. The main church, which is dedicated to the Transfiguration of Jesus Christ was built and decorated in the 16th century( most of it) and the condition of the paintings on the walls is excellent. There are more to see in the monastery, such as the old Refectory, which is one of the museums today, the old kitchen .the winery, the ossuary and other museums, where the visitors can see valuable pieces of art and history. It was organized in 1350 but the main church was built in 1798 and it is dedicated to St Charalambos. There is an interesting museum to see in the monastery, with old crosses, manuscripts and icons. From the balcony the view of the town of Kalambaka and of the plain of Thessaly is impressive. 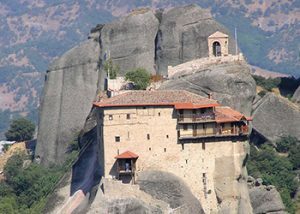 The monastery of Varlaam is located on a high rock, close enough to the Great Meteoro. The first anchorite, named Varlaam, built a church on this rock in the 14th century and organized the first community. In 1517 two brothers from Ioannina, Nectarios and Theophanes, reoccupied the site and they built the present katholikon, a beautiful church, dedicated to All the Saints( 1542). The church is a good example of the post Byzantine style decorated with frescoes, created by Frangos Katellanos. In the monastery there is a museum for the monastic treasures and the old tower, where the visitors can see the ‘net’, the old way for moving up and down people and goods. It is a small monastery on a lower hill. It was founded by two monks from Ioannina, Maximos and Ioasaph, in 1545. The church, dedicated to the Transfiguration , is decorated with frescoes of 1560. Today it is one of the two for the nuns. A number of nuns they live in there and they keep it in a good condition. The monastery, located on an isolated rock, is entered by steps partly in a tunnel through the rock. It was founded probably in the 15th century, when the katholikon was built, dedicated to the Holy Trinity, but the narthex of this church was added in the 17th century. The paintings of the church were created in 1741. From this monastery there is a fantastic view of all the area. 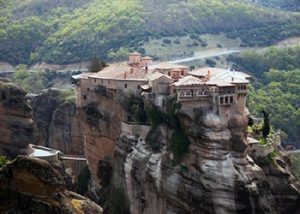 It is the first monastery we see after the village of Kastraki. It is a small community, mostly because of the shape of this rock. The main church is dedicated to St Nicolas and it was built in the 16th century. The paintings of this church were created by the monk Theophanes, from Crete, who is the greatest iconographer of the 16th century.